The Stichting Buitenlandse Excursies was founded in 1983 to organise study trips for students in chemistry and chemical engineering at the University of Groningen. 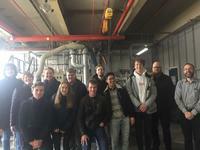 The goal of these study trips is to introduce students to the chemical industry and research in foreign countries, aswell as acquaint them with other cultures. In order to join the study trip, the students carry out a case study for a company. Most study trips consist of 20 students, both from chemistry and chemical engineering. The SBE attempts to organise a study trip annually, both within Europe as further abroad. In the past study trips to Sweden & Finland, Germany, Italy, Iceland, the USA, Chile and Japan have been organised.